One of the greatest joys of my ministry is helping others discover the marvelous, sometimes difficult truths of God's Word. However, before getting started, it is always important to establish the biblical ground rules for studying God's holy word. "Do your best to present yourself to God as one approved, (KJV - "Study to shew thyself approved") a worker who does not need to be ashamed and who correctly handles the word of truth (KJV - "rightly dividing the word of truth.")." 1. "Do your best" - Bible study deserves our diligence and our best effort. It should never be taken lightly. Difficult doctrines require much more than just a casual reading in order to uncover the truth. 2. "to present yourself" - At no other time does our life come under greater scrutiny than when we are studying the words of God. The Bible is like a double edged surgical instrument that opens us up and exposes spiritual cancer. (See Hebrews 4:12.) Please be aware of the intrusive nature of true Bible study. 3. "to God as one approved" - May we never forget that the aim of every Bible study is to gain the approval of God. When the quotes of men and the commentary of mere mortals overshadow the words of God, idolatry is the result. 4. "a worker who does not need to be ashamed" - Again we see the emphasis placed upon the diligence of a "worker" which results in God's approval and no need to be "ashamed." 5. "who correctly handles" - The real work of Bible study is in the guarding of oneself to respectfully handle the holy principles of God. The King James Version renders this phrase, "rightly dividing the word of truth." It is a sobering task to delicately handle such divine information and appropriately labor to rightly divide it into areas of personal application. Much prayer is required. 6. "the word of truth" - Every Bible study deserves to be just that - a BIBLE study. Man's opinions and philosophical dictates often do more to distract from the message than they do to explain it. Only in the words of God do we find eternal truth. We must let the Bible interpret the Bible. These are the principles that govern my Bible study as well as the answers that I provide. While I am far from being perfect, I do attempt to stay within the expectations of 2 Timothy 2:15 and I pray that you too will learn to live within these Divine parameters. 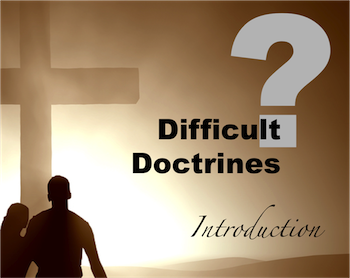 Difficult Doctrines: "Blasphemy of the Holy Spirit, Mark 3:20-30"
Back to Top of "Difficult Doctrines: Introduction, 2 Timothy 2:15"